Background. 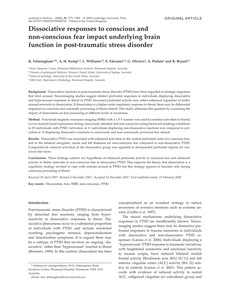 Dissociative reactions in post-traumatic stress disorder (PTSD) have been regarded as strategic responses that limit arousal. Neuroimaging studies suggest distinct prefrontal responses in individuals displaying dissociative and hyperarousal responses to threat in PTSD. Increased prefrontal activity may reflect enhanced regulation of limbic arousal networks in dissociation. If dissociation is a higher-order regulatory response to threat, there may be differential responses to conscious and automatic processing of threat stimuli. This study addresses this question by examining the impact of dissociation on fear processing at different levels of awareness. Method. Functional magnetic resonance imaging (fMRI) with a 1.5-T scanner was used to examine activation to fearful (versus neutral) facial expressions during consciously attended and non-conscious (using backward masking) conditions in 23 individuals with PTSD. Activation in 11 individuals displaying non-dissociative reactions was compared to activation in 12 displaying dissociative reactions to consciously and non-consciously perceived fear stimuli. Results. Dissociative PTSD was associated with enhanced activation in the ventral prefrontal cortex for conscious fear, and in the bilateral amygdala, insula and left thalamus for non-conscious fear compared to non-dissociative PTSD. Comparatively reduced activation in the dissociative group was apparent in dorsomedial prefrontal regions for conscious fear faces. Conclusions. These findings confirm our hypotheses of enhanced prefrontal activity to conscious fear and enhanced activity in limbic networks to non-conscious fear in dissociative PTSD. This supports the theory that dissociation is a regulatory strategy invoked to cope with extreme arousal in PTSD, but this strategy appears to function only during conscious processing of threat. Dissociation, fear, fMRI, non-conscious, PTSD.